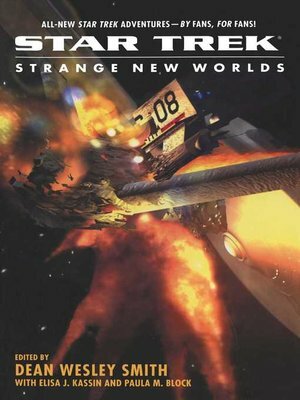 This newest volume of Strange New Worlds features original Star Trek®, Star Trek: The Next Generation ®, Star Trek: Deep Space Nine®, Star Trek: Voyager®, and Star Trek: Enterprise stories written by Star Trek fans, for Star Trek fans! Each of these stories features our favorite Trek characters in new and adventurous situations. In this anthology, we get to experience a new version of the Kobayashi Maru, feel what it's like to be inside the Borg collective, delight in tasting new foods, and encourage Starfleet's future. This year's Strange New Worlds winners encompass newcomers and veterans alike, including Alan James Garbers, Kevin Lauderdale, Kevin Andrew Hosey, Paul C. Tseng, Kevin G. Summers, Sarah A. Seaborne, John Takis, Dan C. Duval, Amy Vincent, David DeLee, Muri McCage, Susan S. McCrackin, M.C. Demarco, Annie Reed, Amy Sisson, J.B. Stevens, Robert Burke Richardson, Lorraine Anderson, A. Rhea King, Derrek Tyler Attico, Geoffrey Thorne, and Paul J. Kaplan.